Everyone who owns a site or works on a site can use our tool to secure their sites from HTTPS mixed content warnings. We provide 2 tools to help you migrate and to maintain a strong HTTPS site. 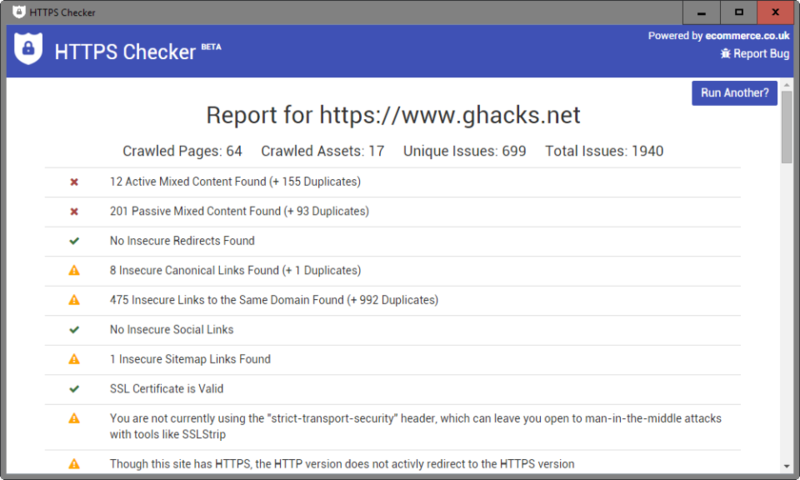 Use HTTPS Checker to proactively scan sites making it ideal for pre-migration checks and then use HTTPS Reporter on a live HTTPS site to capture issues in real-time for continuous monitoring. Overall: Helped migrate many of our sites to HTTPS by tracking down the mixed content warnings before users find it. Used this software after converting several of my websites from http to https. Pros: Very easy to install and use. Lets you know exactly what errors your website has, and what needs to be done to correct it. Cons: Some of the suggested corrections are difficult to understand. Unless you are a programmer, you won't know how to implement some of the suggested corrections and you may need to hire an outside consultant to help. Overall: Helps identify errors after my http to https conversion. The free version is more than adequate.